Teenager Juan crashes his family’s car into a telegraph pole on the outskirts of town and then scours the streets searching for someone to help him fix it. His quest leads him to Don Heber, an old, paranoid mechanic whose only companion is his dog Sica; to Lucía, a young mother who is convinced that her real place in life is as a lead singer in a punk band; and to “The One Who Knows,” a teenage mechanic obsessed with martial arts and Kung Fu philosophy. The absurd and bewildering worlds of these characters engage Juan in a one-day journey during which he will come to accept what he was escaping from in the first place—an event both as natural and inexplicable as a loved one’s death. Fernando Eimbcke was born in Mexico City in 1972. As soon as he finished his film studies at UNAM, he went on to make over ten short films and direct several music videos for Mexican and Spanish rock bands. 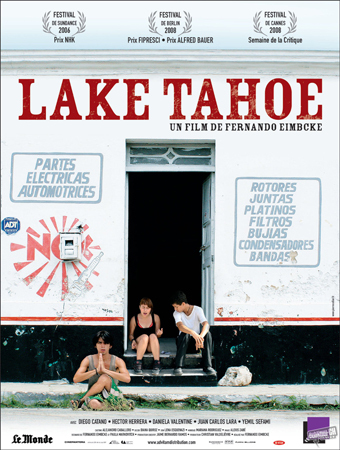 Lake Tahoe is his second feature film, following the critically acclaimed and box office success Temporada de patos, which screened at Cine Las Americas in 2005.